Some of Robert Campbell's past, present and future talks, workshops and webinars. Communication is vital when you are facing the end of the world. In this lively session the authors of the eBook English for the Zombie Apocalypse will demonstrate how alternative contexts can be used to teach functional English. Participants will actively follow a sample zombie survival lesson before discussing the methodology and thinking behind this and future survival projects. To be successful at school (and later on in life), students need to learn skills that go beyond pure academic knowledge. But how can a teacher best use the material from a coursebook to make language useful for their students’ academic, social and future working lives? In this talk, we will look at practical ways to teach life skills to secondary school students. With video playing such an important part in teenagers’ lives and now a major feature of course books, how can we help students get the most from video both inside and outside the classroom? In this talk we’ll explore ways of using ‘authentic’, ELT, and student-created videos. I’ll also share my experience of creating video material for Beyond.. In this lively session the authors of the eBook English for the Zombie Apocalypse will teach a sample survival lesson to learners, demonstrating how alternative contexts can be used to teach functional English and motivate students. We’ll then look at the methodology and thinking behind this and future survival projects. With video playing such an important part in teenagers’ lives and now a major feature of course books, how can we help students get the most from video both inside and outside the classroom? In this workshop we’ll explore ways of using ‘authentic’, ELT, and student-created videos. I’ll also share my experience of creating video material for Beyond. When it comes to preparing our students for success in and beyond the classroom, teaching life skills such as active listening, empathy and teamwork play a vital role. In this presentation we'll look at how learning life skills helps our students meet the demands of a changing world, and why the English class, with its emphasis on communication, is a good place to develop these 21st century skills. As we look at a range of classroom activities and lesson ideas, we'll also see how life skills can boost our students' English skills. With multimedia playing such an important part in teenagers' lives today, how can we use multimedia in the classroom to make learning more meaningful and motivating while at the same time helping to develop our students' digital literacy? In this webinar we look at some simple ways to bring technology into the classroom as well as exploring the wide range of multimedia that today's course books offer the tech-savvy and not-so-tech-savvy teacher. How can you make a positive start to the new academic year and establish a good relationship with your class? How can you engage and activate your students while at the same time challenging them to aim high and invest in their own learning? In this webinar we look at ideas for those important first classes, as well as focusing on key principles to get the most from your students throughout the year. I'm an English teacher. Why should I teach life skills? We often teach life skills such as active listening and empathy to primary children and then assume that secondary age students have them at their disposal. But in a changing world, with changing influences on students' behaviour, there are strong arguments in favour of helping teenagers to develop essential 21st century skills in order to cope with daily life and future challenges. In this webinar, we consider why teaching overt life skills as part of a general English course can not only give teenagers a strong foundation for life, but also boost their English skills. Follow the link for more details and to download the slides. In today's changing world, secondary materials need to reflect the students' lives and prepare them for life beyond the classroom. 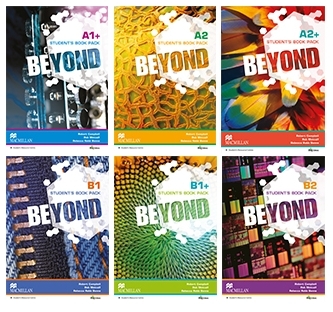 Beyond is a new 6-level international secondary course that develops both linguistic and life skills. In this talk, the authors of the course present its unique sub-skills syllabus, and the videos that bring its pages to life.